Does the LOWEST Price Always Have to Win? It's so frustrating. You have a good product or service. A prospective client, one you would really like to win, asks you to submit a proposal or quotation. You do, and LOSE, because the prospective client decided on PRICE and price alone. In that situation, the lowest price ALWAYS wins. Many businesses do not set prices at the retail level. Instead they respond to requests for quotations or proposals. Usually it is not done it well, and they end up competing on price. 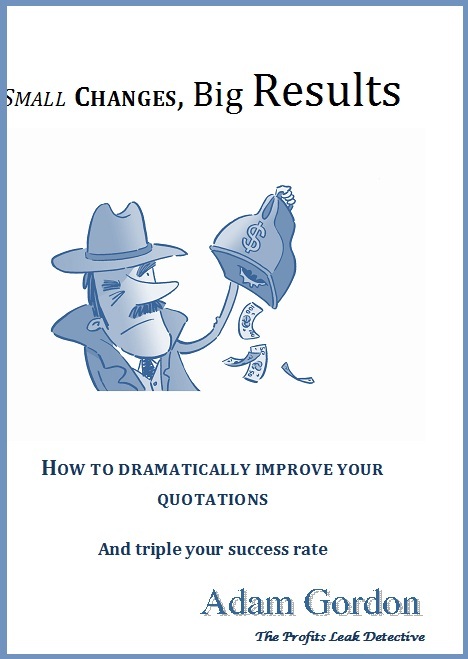 If you are caught in this trap, then Small Changes, Big Results - How to Dramatically Improve your Quotations is for you. Presenting proposals and quotations properly offers you THE OPPORTUNITY to differentiate yourself from your competitors, so that PRICE is not the key decision factor. You CAN remove price from the decision process by following the steps in this book. It provides a template on which to build your next proposal or quotation. In doing so you will increase your success rate and grow your sales and profits without having to create more leads. You know the value of your average sale, and your quotation success rate. What would be the impact on your bottom line if you could increase your quotation success rate from, say, 30% to 40%? This manual provides expert guidance on how to do so. Even just one more successful quotation will more than repay this investment. Simply TRY the Buy Button below and let's get started together on your journey to higher success rates, greater profits and more free time!